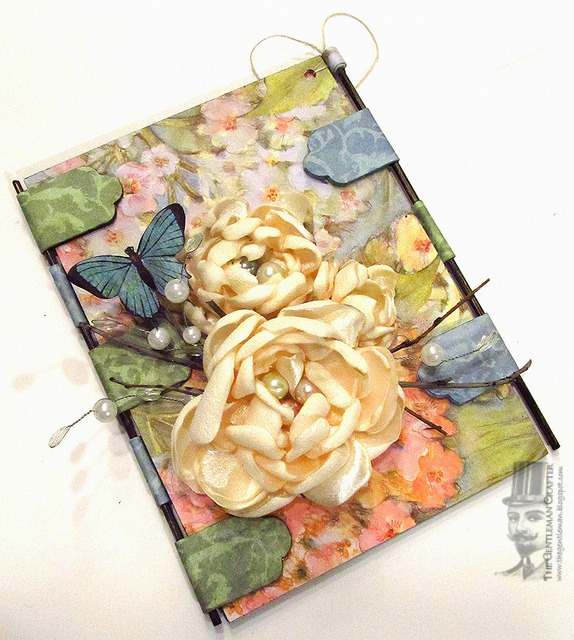 The Gentleman Crafter: Ustream Card! 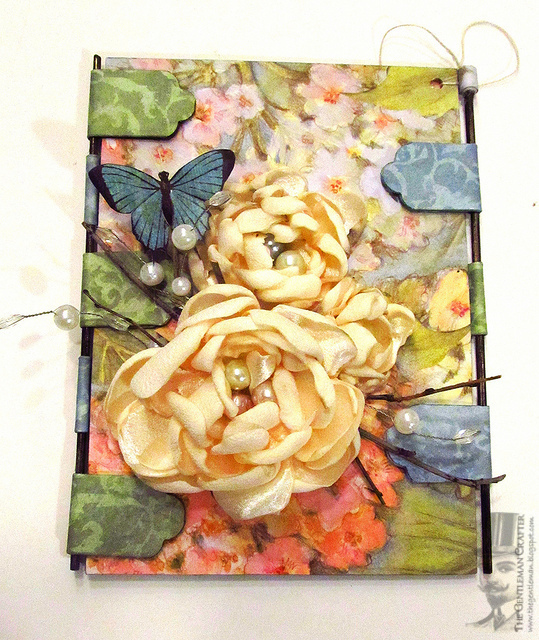 Just about to hit the hay, but I wanted to share with you the finished card we worked on last night in my Ustream show... It's my favorite card to make....By the way, I so appreciate you all coming by. It was so much fun! Thank you for being there! I really had a blast and hope you did too! We never finished the card. Probably due to my long winded stories and showing you my war wounds! Bahahahaha! Oh yeah, having to start the recording 5 times and changing the camera didn't help! LOL! So tonight, I wanted to show you the finished card...Oh yeah, let me add this first....I started a YouTube video of how to make the card tonight from start to finish. I will post that tomorrow. The YouTube card I taped tonight is a whole different look using the Cosmo Cricket Circa 1934 Paper Collection. Funny how a different paper using the same technique can have a whole different look and meaning! Have an Awesome Night...See ya tomorrow! The card turned out just beautiful!! Love the skewers and your flower is so pretty. I had alot of fun on u-stream, you are so funny. I'm so glad you started streaming it really gives us all something to look forward to every week. Happy Easter to you, Cesar and Momma. Oh Jim... What a beautiful card! It is just gorgeous! 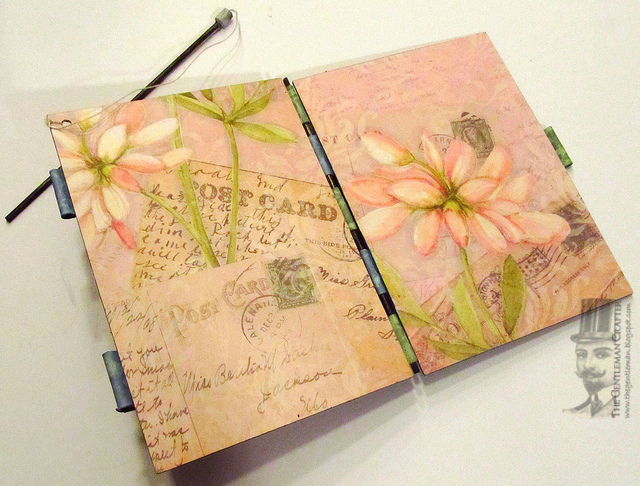 I'm going to have to find time to try to make one as it would be great for Mother's Day! Thanks for the inspiration! Wishing you and yours a most blessed and happy Easter! Absolutely beautiful. I really love the flower on the front, I am going to have to try this. I love your Ustream shows. I don't usually try to chat, it moves so fast, but I enjoy watching. You and Cesar make a great team. Have a great weekend and a safe and Blessed Easter. So glad that you posted photos of the finished card - it's stunning! I really enjoyed the part of your Ustream show that I saw and it was great to chat with everyone. Delo is right - you and Cesar do make a great team! Wishing you both a really lovely Easter. Wow... Your card turned out beautiful! 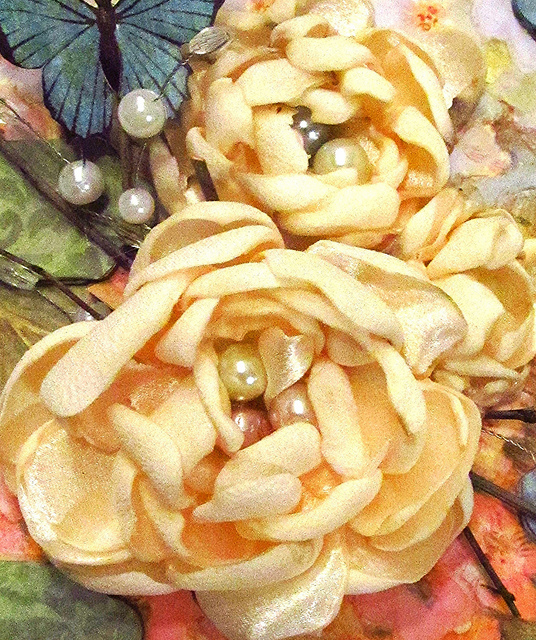 It is so nice to the flowers all finished! I love them! Hmmm... Youtube video... I can't wait! I hope your big day goes well! It's almost the weekend... time to craft, Yahooooo! Enjoy your day! Such a great card! Class on Tuesday was a blast. Looking forward to watching the YouTube to get all the measurements. Enjoy the rest of your week. WOW...Love the card!!! I really have to try the flower technique...if I can do it without having to call 911...LOL!!! The finished card is simply beautiful!!! Happy Easter to you and Cesar!!! Hope the bunny is good to you! Wow! That's what you made.......I don't remember that. All I remember is being petrified that you were going to burn yourself, Cesar or the house down. Those flowers did turn out beautiful. Still not sure if I would trust myself to do it. I will have to add this card to my"bucket list of Jim's crafts to make someday when I am 90!" I hate to put more ideas in your already overflowing head, but the bottom closeup image of the card would make a beautiful painting! Nice job. Class was great. Thank you for the inspiration. :) thanks for the finished Pictures!!!! That is a very pretty card, inside and out. I love the way the card opens with the skewers. Jim, this is absolutely beautiful. You are beautifully talented! Oh Jim...it's just stunning! Just gorgeous! Just frilly! Love the design...the closure and the hinges...all genius! I wanted to make it to the Ustream so I could shout "CONGRATS" for RU, but baseball got in the way...we won too! You will have the best experience ever, and get to meet my buddy Marjie and Cristy and you already know Ellen. What a great group it will be!!!!! I watched most of the recording - between the sharp blades and the fire, it was a real action film! Lol. The finished card is totally worth the danger. I sill have the 1934 paper and I'm willing to cut into it to make this card.By the way, Jim, you take terrific photos. Just thought you would like to know..... people are talking abou YOU EVERYWHERE!!! A couple of random threads on a SCS. A couple of different FB groups....They know you are Jim something but you are a gentleman and that you are from Texas..but the main focus is YOU WON'T BELIEVE WHAT ALL THIS GUY DOES WITH PAPER!!! I am tossing in the link to your blog when I can.... You make me proud to be a fellow Texan! Oh and very excited that you are going to by teaching at the Crafty Scrapper!! That is just a hoot and a hollar down the road from me here in Palmer! Hope to meet you soon. I am here in Australia, and just wanted to repeat the comments above.Thanks for your ever- so- helpful videos.Isn't it wonderful to live in an age where people share so much on line. I have learned so much from You Tube!! !All those generous people. Such a beautiful card! Looking forward to the youtube video. You rock! Have a blessed Easter! This is beautiful, Jim. I love that flower and seem to recall a tutorial for it? Can't wait for the video!